This extraordinary piece of fine silver has a surface area that exceeds 15 square inches...and it contains one Troy ounce of fine silver! And now, for a limited time during the strike period, the year 2016 $100 Silver Proof is available at a special price! 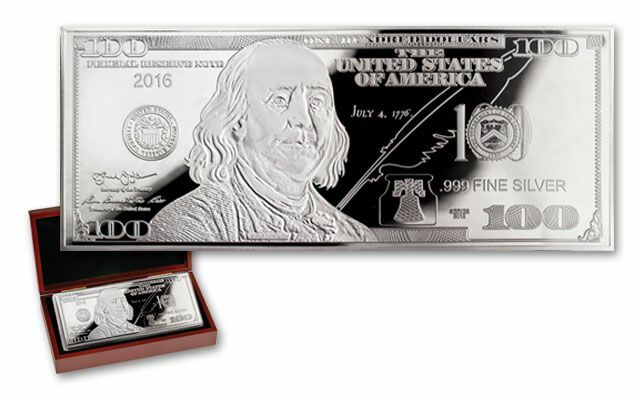 The historic 2016 $100 Silver Proof is an exquisite adaptation of the United States Treasury's newly designed $100 Federal Reserve Note. Benjamin Franklin has only appeared on four $100 bill designs over the last 100 years. This dramatic artistic masterpiece will always be treasured. Best of all, this stunning proof is even more beautiful than the original, because it's struck in precious silver! It is a landmark in proof minting, combining unprecedented weight with extraordinary dimension. The specifications for this colossal medallic proof are unparalleled. Each one: • Is Individually Struck from Fine .999 Silver. • Weighs One Troy Ounce. • Has a Surface Area That Exceeds 15 Square Inches. • Contains 31.10 Grams (480 Grains) of Fine Silver. • Is Individually Registered and Comes With a Numbered Certificate of Authenticity. • Is Fully Encapsulated to Protect Its Mirror-Finish. • Includes a Deluxe Presentation Case. 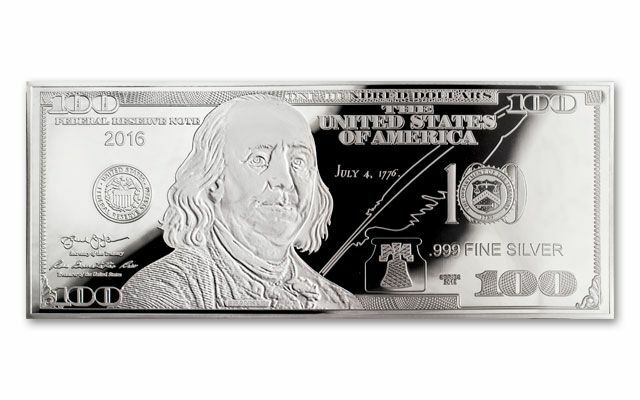 The 2016 $100 Silver Proof is being released exclusively through GovMint.com and is not available anywhere else. When you place your order for the $100 Silver Proof, it will be processed immediately, and the earliest orders will receive the coveted lowest registration numbers. 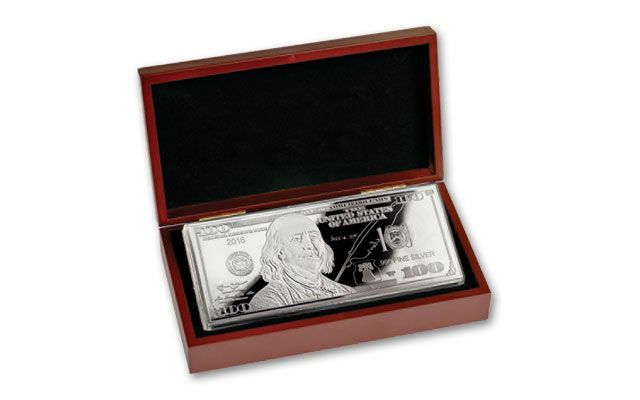 By placing your order now, you can acquire this giant silver proof for only $99. GovMint.com will limit striking to only 9,999 one-Troy-ounce Silver Proofs for the year 2016. With over half the mintage already gone, the time to call is now! Substantial additional discounts are available for serious collectors who wish to acquire more than one of these exquisite silver proofs. Please note: There is a limit of twenty $100 Silver Proofs per order, and all orders are subject to acceptance by GovMint.com.